Northstar offers lots of fun activities this Summer! 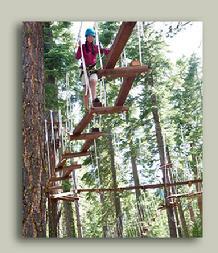 Northstar at Tahoe is offers scenic lift rides for sightseeing and hiking in the summer. Come out and hop on the Gondola, Tahoe Zephyr Express or Vista Express chairlifts for a scenic ride to the top of the mountain. Four-legged friends also are welcome on a leash. Gondola and chair lift rides will run Friday through Sunday starting mid June (check with Northstar for exact dates) from through mid October (of course, weather permitting). You can get your hiking lift ticket or pass at the Season Pass office at Northstar. Click on the mountain bike picture for a list of mountain bike trails on the North shore of Lake Tahoe. And for information on hikes in Tahoe, please click on the picture at right. Northstar 530.562.8800. For North Shore theaters in Tahoe City, Kings Beach & Incline Village, call 530.546.5951 for showtimes. through August. Prizes for best retro dressed guest. From mid-July through mid-August, you can experience Shakespeare on the East shore of Lake Tahoe at Sand Harbor Beach. Buy tickets ahead of time by going to laketahoeshakespeare.com or by calling 800-74-SHOWS. Bring your own cooler full of food, from cheese & bread to wine or your beverage of choice. Nights can get cool, so don't forget to bring extra coats & blankets, and of course, chairs to sit on. The atmosphere is fun-loving, and the plays are always entertaining. The backdrop of Lake Tahoe behind the stage is not to be missed! Guided tours of the Thunderbird Lodge take place from May through October. Tours by shuttle begin in late June. Parking and shuttle pickup for Thunderbird Lodge tours are at the Incline Village/Crystal Bay Visitor's Center, 969 Tahoe Boulevard, Incline Village, NV. Tours embark from the Hyatt Lake Tahoe in Incline on the 55 ft. catamaran Sierra Cloud on Sundays at 9:30 am, June through August. Call the Hyatt at 800-553-3288 or 775-832-1234 to make reservations. Another boat tour departs from Tahoe Keys Marina in South Lake Tahoe on the classic wooden boat Tahoe six days a week. Ticket prices include a narrated cruise along the lake's beautiful east shore, tour of the Thunderbird Lodge Historic Site and lunch on the site grounds. Call Woodwind Cruises at 888-867-6394 for reservations. The more adventurous may paddle kayaks or canoes to the site each Tuesday morning from June through late September for a tour beginning at 10:00 AM. The closest place to launch is Sand Harbor State Park, on Highway 28 about 1 3/4 nautical miles north of the historic site. Cost is about $20 per person for a 1 1/2 hour guided tour. Call for reservations at 775-832-8750. Bungy trampoline adventure welcomes all ages (20-210 lbs) and are open daily noon until dusk weather permitting. You can find them in the Village at Northstar on the Village Overlook upper level. During the summer months only, they also have a ropes course and coming June 2009 will be a climbing wall. ROPES COURSES IN TAHOE VISTA & SQUAW - California’s first Treetop Adventure Park where ropes course meets zip line on steroids takes thrill-seekers on an all-out adrenalin tour that puts agility, quick-thinking and stamina to the test. Some of the features include tree platforms, zip lines, a variety of bridges including a 120 foot suspension bridge and a highwire bike. There are different courses for kids and adults alike. Once you go through the courses and determine the obstacles, you’ll want to do it again and again, testing yourself every step of the way. Contact Us via email to info@LakeTahoeMountainVacations.com or go to our website www.LakeTahoeMV.com or Northstarcondos.com. Our phone number you call or text to is 530.562.2663 or 530.562.condos.